Aaron Kelly grew up thinking big and making plans, and wondering where those trains were going to. Falling under the influence of Townes Van Zandt, John Prine, and Jack Kerouac, his songs aren’t too dissimilar from the crates and packages of the last century. They carry the promise that something good is coming. These are songs meant to ease a burden and bring a smile, carefully crafted and made to last. 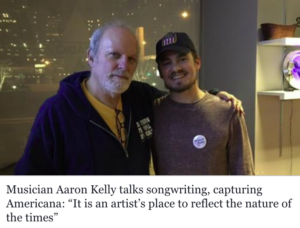 Aaron has been featured by American Songwriter Magazine, and released Barefoot and Bottomed Out, his first solo album, in 2016, after zig-zagging across the country for years with his band, Overman. He’ll release his second solo album, Songs Still Sing, in 2019.